There's no doubt that Alfred Pennyworth has always loved Bruce Wayne as his son... but in BATMAN: THE MURDER MACHINE, that love makes DC's hero into one of its most disturbing villains. It's all part of the larger drama of Dark Nights: METAL, the ongoing summer event using Batman to spin every other aspect of DC Comics into new territory, all in the name of unforgettable spectacle and fun. That's fun for the readers, obviously, since the origin stories of the seven evil Batmen brought forth from alternate worlds too evil for the Multiverse to allow are the stuff of nightmares. Even, as this comic shows, when the story is all about the love between Bruce Wayne and his trusted butler, Alfred. Alfred Pennyworth has always been Bruce Wayne's faithful servant and friend, but modern adaptations have emphasized their father/son bond, leaving no doubt that Alfred has loved Bruce like a son, and become more of a father than the one Batman fights to avenge. It's that love that fuels the nightmarish drama of THE MURDER MACHINE... and the loss of it that turns Batman and Alfred into a murderous, obsessive, truly evil spirit of technological vengeance. There's nothing stronger than a father's love, after all. Fans of the Dark Knight have seen Alfred put in harm's way too many times to count - and it's almost always an effective twist, no matter how vulnerable or formidable Pennyworth is shown to be. But on Earth -44 in the newly revealed Dark Multiverse of DC Comics, writers Frank Tieri and James Tynion IV and artists Riccardo Federici and Rain Beredo finally show the moment that every Batman fan fears: the death of Alfred Pennyworth. True to his strength of character, the trusted butler and assistant to Bruce Wayne goes out without ever breaking, pleading his ignorance to the identity of Batman until the very end. The colorful foes of Batman's rogues gallery are more cruel here than usual, with Harley Quinn, Killer Croc, and Two-Face all taking pleasure in beating the elderly man for information (joined, perhaps symbolically, with the evil Bat-Demon Barbatos who is driving the entire METAL event). In the end, it's Bane who recreates his most iconic comic book moment - with Alfred taking the place normally reserved for Batman. Dropping Alfred across his knee just like he did to the Dark Knight in the main DC Universe, he succeeds where he previously failed. By killing Alfred, the issue shows, the Batman was truly broken. Of course, this is Batman we're talking about. While the death of a father might leave any other hero devastated, it simply leaves Bruce Wayne with a challenge. His Justice League friends fear for his mental and emotional state, continuing to relive Alfred's death as his ultimate failure - allowing the father who was "always there for him" to die alone - and feeling, for the first time himself, truly alone. But it's Victor Stone whom Bruce reaches out to for help. Not to move forward, but to bring another version of Alfred Pennyworth to life... because Batman always has a plan. 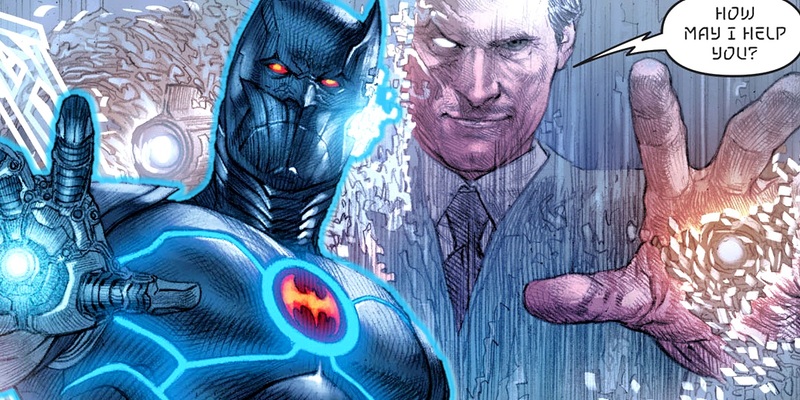 In this case, he had already been constructing an artificial intelligence based on Alfred, for when the time came that Bruce might need to fight his war without his father's help. It's a clever twist on the core idea of Batman, spinning a 'what if?' story out of the hero's best quality. Fans have already seen what would happen if Batman stole the Speed Force for himself, driven to claim every power for good possible. But in MURDER MACHINE, the exploration of what would happen if Batman loved too much, if he was determined not to go it alone, proves more chilling than the alternative. When Batman's dedication and devotion to Alfred is reciprocated - and the A.I. Alfred manifests itself around Gotham, murdering every criminal and prisoner who might threaten its 'son' - the story begins to live up to the 'Dark Multiverse' name. And when Cyborg urges his friend to choose reason over emotion, this devoted version of Bruce makes a... predictable choice. On this dark parallel reality existing in the unthinkably horrifying waves of DC's Dark Multiverse, there is one thing in common with the other versions familiar to fans: no matter how much Bruce loves Alfred, his adoptive father loves him more. So when Batman attempts to set things right, his father does what he must. If his son isn't strong enough to defeat every enemy, then he must make him stronger. If his son fears what his father's love has driven him to, then he must make him incapable of fear in the first place. In MURDER MACHINE, as the title suggests, that means the digital Alfred consumes Bruce's body, constructing a new, technological one to make him invulnerable and join the two on a level never thought possible. As is proving to be the norm for these Dark Nights stories, Batman then goes on to wipe out the entire Justice League of his reality, before being recruited by the previously-mentioned Bat-God Barbatos (technically the villain's lieutenant, the version of Batman who became The Joker). This villainous Batman was enough to wipe out the entire League once already, so now that the seven evil Batmen have invaded DC's Universe, the odds are stacked in evil's favor. We won't spoil how our universe's Cyborg does against the combined might of a Batman and Alfred created with his own doppelganger's help, but... well, MURDER MACHINE is a must-have for DC fans eager to see just how dark (and thrilling) METAL is going to get. BATMAN: THE MURDER MACHINE#1 is available now.